This site is dedicated to the traditional Anglican expression of the One, Holy, Catholic and Apostolic Church of Our Lord Jesus Christ. We profess the orthodox Christian Faith enshrined in the three great Creeds and the Seven Ecumenical Councils of the ancient undivided Church. We celebrate the Seven Sacraments of the historic Church. We cherish and continue the Catholic Revival inaugurated by the Tractarian or Oxford Movement. Universality, Antiquity and Consent. at 8am, Noon, and 7pm. The Affirmation of Saint Louis (1977) is the foundational document of the Continuing Church. The Affirmation distinguishes the Continuing Churches from earlier Anglican bodies, such as the Episcopal Church prior to 1976, which were vaguer and deliberately more ‘comprehensive’ in their doctrine and moral teaching than are the Continuing Churches. The Affirmation also distinguishes the Continuing Churches from neo-Anglican bodies (such as the Anglican Church of North America, ACNA) and from modernist Anglican bodies (such as the Episcopal Church after 1976). The Affirmation is the foundation of and is embraced by the 2017 agreement of the so-called G-4 Churches (Anglican Church in America, Anglican Catholic Church, Anglican Province of America, and Diocese of the Holy Cross) to establish full communion (communio in sacris) amongst themselves. The Affirmation states its doctrinal catholicity in a form more detailed than in earlier Anglican formularies. It then asserts that ‘In affirming these principles, we recognize that all Anglican statements of faith and liturgical formulae must be interpreted in accordance with them.’ That is to say, the Affirmationestablishes itself as an interpretative lens for viewing, and as an hermeneutical principle for understanding, ‘all Anglican statements of faith and liturgical formulae’. The relationship between the Affirmation and these earlier statements and formulae might usefully be understood as analogous to the relationship between the Nicene and Apostles’ Creeds. The Nicene Creed is later and fuller than the Apostles’ Creed. The Nicene Creed deals with questions and heresies that arose after the Apostles’ Creed. The Nicene Creed does not invalidate the Apostles’ Creed, but it establishes a clarifying lens through which the Apostles’ Creed is read and interpreted. ‘Anglican statements of faith and liturgical formulae’ in this respect means peculiarly or uniquely Anglican statements and formulae. Such Anglican statements and formulae are contrasted with universal or Catholic statements of faith, such as the Creeds, and universal liturgical formulae, including common forms such as the Gloria in excelsis, the Te Deum, and other Catholic and doctrinally-rich prayers and hymns. Examples of Anglican liturgical formulae include most notably the historic Book of Common Prayer, in its various editions. Anglican statements of faith include notably the Thirty-nine Articles of Religion and the Tudor Homilies. The Affirmation, therefore, asserts that these particularly Anglican formularies are not the interpretative lens through which we view the wider, Catholic formularies of the Church. Neither are peculiarly Anglican statements and formulae a kind of Occam’s razor to limit and circumscribe what may be concluded from those wider and more universal formularies. The reverse is true: the universal and Catholic limit and define the possible meanings of the peculiarly Anglican. That is to say, the universal tradition of the Undivided Church of the first millennium is primary and limits and governs the reception and interpretation of peculiarly Anglican statements of faith and liturgical formulae. Many Anglicans have always believed this to be the case. The Affirmation explicitly and officially requires this. The G-4 Churches believe the Eucharistic faith of the Catholic Churches, which is substantially that of the undivided Church of the first millennium. This faith is authoritative, and Anglican statements concerning the Eucharist must be understood in a manner consistent with the faith found in the central tradition of the great Churches of the East and West and in the consensus of the first millennium. Ambiguities and questions left by reading Anglican formularies are, for the G-4, defined and settled by looking to the faith of the wider Church. Polish National Catholic participants in the inaugural session of the PNCC/G-4 dialogue, reflecting such concern, asked their G-4 interlocutors for a written clarification of our understanding of Article XXVIII. We here offer the following clarifications. First, Eucharistic adoration and Eucharistic reservation are present in the life of the Catholic and Orthodox Churches. 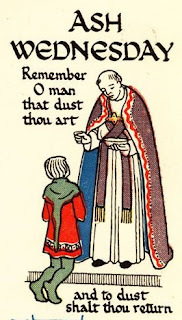 Such adoration and reservation, therefore, meet the criteria of the Vincentian canon and as such enjoy the approbation of the Affirmation, whatever any Anglican statement might appear to say to the contrary. Secondly, the Articles must be interpreted in their historical context, which to some extent modifies their meaning and relativizes their authority. ‘Transubstantiation’ in a mid-16th century document antedating the Council of Trent, such as Article XXVIII, does not and cannot refer to Tridentine or modern Roman Catholic understandings of Transubstantiation. Much less does or can Article XXVIII refer to understandings of the Real Presence which use other terminology such as ‘transelementation’ or ‘transformation’ common in the Eastern Orthodox Churches and in other Catholic Churches. In short, Article XXVIII must be understood as a condemnation of popular but common medieval Western theological opinions, of crassly materialistic Eucharistic theories, and of errors often repudiated and corrected also by subsequent Roman Catholic and Eastern Orthodox theologians. Article XXVIII should not be understood, much less accepted, as repudiating the central Eucharistic belief of the universal Church. Thirdly, the language of Article XXVIII when understood in a strictly literal fashion does not mean what casual readers often conclude. It is perfectly true, as Article XXVIII says, that ‘the Sacrament of the Lord’s Supper was not by Christ’s ordinance reserved, carried about, lifted up, or worshipped.’ On the contrary, the Sacrament of the Lord’s Supper was instituted by Christ to be received in Holy Communion. Holy Communion is the main and root reason for the institution of the Sacrament of the Altar: to feed God’s people with the Body and Blood of the Lord and to constitute them, in the Eucharistic celebration and through their communion therein, as the royal, priestly people of God. It does not follow, and Article XXVIII does not say, that the Sacrament may not be reserved, to extend and make easier the communion of the sick. Nor does it follow, nor does the Article say, that Eucharistic adoration is inappropriate and not a logical and godly extension of the facts of the objective and salvific Real Presence of Jesus Christ, God the Son, in and through his sacramental Body and Blood. The Article speaks only of the first and main reason for the institution of the Sacrament, not of its full meaning. Again, the Article condemns medieval abuses in the Church, when non-communicating Masses became the norm and secondary meanings of the Eucharist became effectively primary. Fourthly, we recall the Catholic principle, Lex orandi statuit legem credendi: the rule of praying establishes the rule of belief. In all of the G-4 Churches, missals that include the Feast of Corpus Christi are in use and the Eucharistic hymns attributed to Saint Thomas Aquinas are sung. In 2019 an Ordo Kalendar was produced jointly for all of the G-4 Churches that includes this Feast. In all of the G-4 Churches, Benediction of the Blessed Sacrament is offered. In all of the G-4 Churches, Eucharistic reservation is practiced. In all of the G-4 Churches, honor and worship and adoration are offered to our Lord really present in the tabernacles of the churches. The actual practice of all of the G-4 Churches provides a clear and practical statement of the actual Eucharistic faith and doctrine present in the G-4. This faith is not just that of the G-4 clergy present in dialogue with the PNCC, but is also that of our layfolk and clergy and parishes. On January 22nd of this year, the New York State Legislature passed the Reproductive Health Act, a statute that expands the state’s already liberal abortion policies by allowing the termination of pregnancy up until the moment of birth; permitting physician assistants, nurse practitioners, and licensed midwives to perform abortions; and removing penalties for performing an abortion from the state’s penal code. Not only does this legislation allow for the killing of a viable human child, it runs the risk of exposing women to higher-risk medical procedures and removes protections against domestic abuse. Already a New York prosecutor has dropped felony abortion charges against a man who murdered his girlfriend and their unborn child. In Virginia, where similar legislation has been proposed, the current governor has made statements that appear to endorse the notion that babies who survive late-term abortions could be left to die. Such sentiments reveal how far removed the pro-abortion movement is from the values expressed in a document penned by another governor of Virginia, one which asserts that all humans are “endowed by their Creator with certain unalienable Rights,” and “that among these are Life, Liberty, and the Pursuit of Happiness.” A society founded on these principles cannot support legalized abortion. If the right to life is unalienable, it belongs to the individual alone, and cannot unjustly be taken away. Moreover, the right to life possesses a logical priority in that all other rights flow from the individual’s status as a living being. Curtailing the right to life undermines the principles of natural law and threatens the very fabric of our democracy. We ask all of this with the fervent prayer that every life may be cherished and every person may be recognized as a child of God. 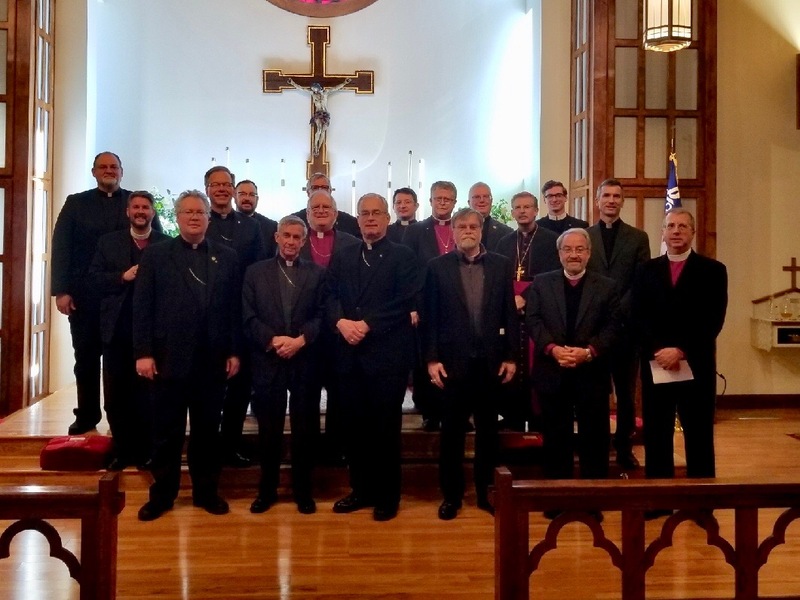 Saint Barnabas Dunwoody was blessed and honoured to host the inaugural meeting of the official Anglican Joint Synods (G4) - Polish National Catholic Church Dialogue Tuesday 15th January and Wednesday 16th January. American Anglicanism and the PNCC were sister Churches which enjoyed full sacramental communion with each other from 1946 until 1978, and it is fervently hoped that that relationship will soon be restored. Please pray for the ongoing Dialogue, for its representatives, participants, and delegates, and for its sacred labours. Tomorrow, 21st December, the Feast of Saint Thomas the Apostle, is the Twenty-Second Anniversary of my Ordination to the Sacred Order of Priests in the One, Holy, Catholic, and Apostolic Church of Our Lord Jesus Christ. The Ordination took place in the Anglican Catholic Church (ACC) Diocese of the Mid-Atlantic States; the ordaining Bishop was the Most Reverend John Thayer Cahoon, Junior, Bishop Ordinary. The Mass of Priestly Ordination was celebrated at Saint Paul's Church, Lexington, Virginia, where I served my title as Curate. 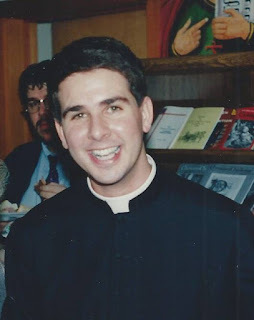 Today's grey and bearded bishop has aged a little since the photo was taken that day of a 25 year old neo-presbyter. Please pray for me and God bless you! Remember to keep Christ in Christmas - and Mass in Christmas! Please come worship with us! 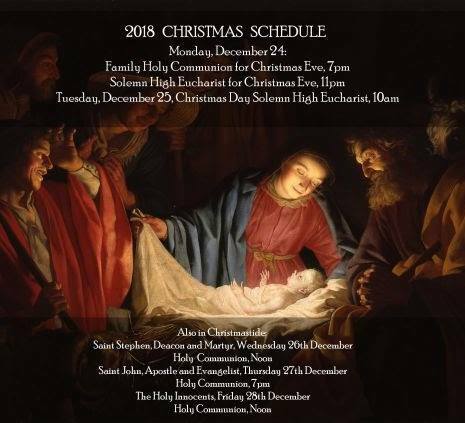 For a full schedule of upcoming services in Christmastide, please see our Kalendar. 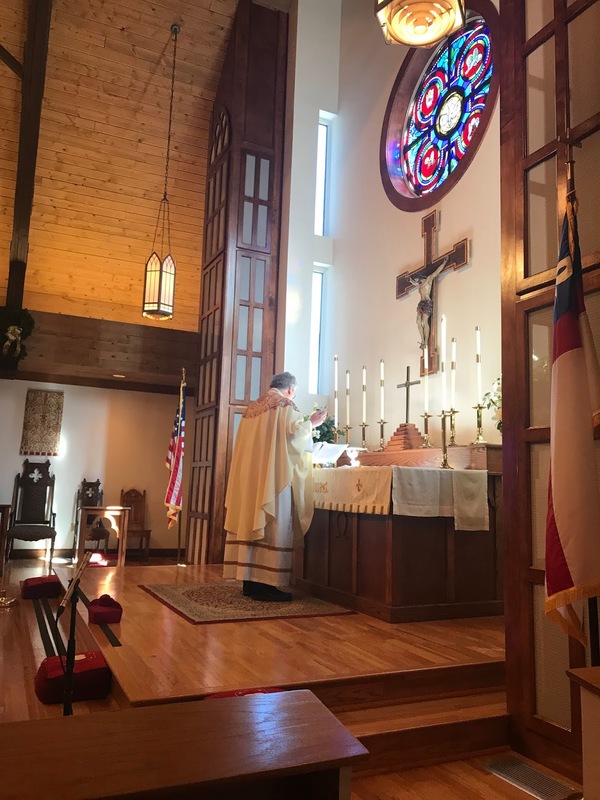 Rector of Saint Barnabas Anglican Church in Dunwoody, Georgia, I am the Suffragan Bishop of the Diocese of the Eastern United States of the Anglican Province of America. I am a member of the Society of the Holy Cross.